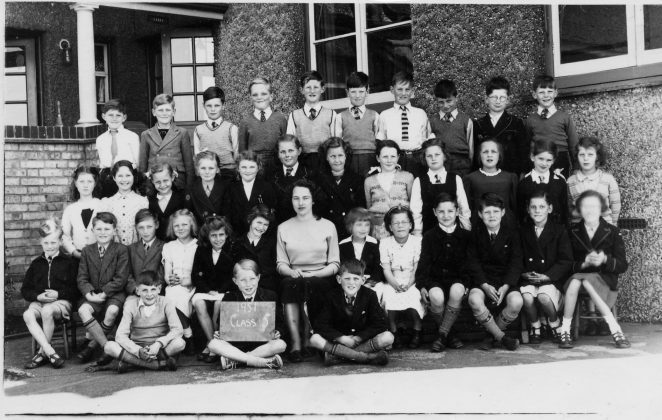 I found this old school photo of Balfour Road Juniour School Taken in 1951 of class 5. I am third from the left in the back row. Some of the names of the other children are, Maurice Mepham, Phillip Lloyd, Alex Beal, Peter Palmer, Jacqueline Clarke, Ann Healey, Janet Robson, Roy Cooper and Tony Winscull. Please excuse me if I have spelt the surnames incorrectly. I feel sure that visitors to this site will be able to add more names. I think I recognise one of the faces on this school photo. Is there a Susan Maggs on it? I went to Balfour Road School from 1945 to 1949. It was a greal school. The headmaster was Mr Slater. My favourite teacher was Miss Williams. I lived with Phillip Lloyd and Peter Lloyd who also attended Balfour Road School in the 40s and early 50s. I remember Miss Drake and Miss Bushel. I also was at Balfour Road from 1945 to 1950. And yes, Mr E D Slater was the headmaster(and a great one). My very first teacher was a Miss Bottomley, my last teacher was a Mrs Cowtan. I wonder if the Peter Lloyd referred to was the same one that I knew. He lived in Balfour Road almost opposite the school entrance. I think all the “Gordon Road Gang” were at the school at this time (Brian Blacker, Alan Whatling, Frank Saunders etc). Let me just briefly mention the school activities. There was emphasis on the 3Rs with rote learning of tables etc and practice intelligence tests. There was also a great ethos on competitive sports especially playing against other schools; once or twice a year there were set sports of boys vs girls. I remember that we had our own little vegetable plot and as we got older we were set various special projects which entailed going to the reference library in Church St. All this in the 40s. They were indeed great days. I was at Balfour Rd School in 1936. The Head Mistress Miss Seward, Then in 1940, the school was converted into a Military Hospital. Has anyone more memories? I attended Balfour CP school from 1961-63. My teachers were Miss Bishop, Miss Bacon, Mrs Moore and Miss Cowtan. Yes, Mr Slater was an excellent headmaster and the school had a great reputation. I remember Mr Slater used to award coloured badges each week for different academic achievements. I remember lining up on his wooden staircase to receive our badges. I remember knitting with Mrs Moore – we made hot water bottle covers. Also decorating the classrooms at Christmas time. Mrs Moore always made big crepe paper pompoms. Miss Cowtan’s class always made the 12 days of Christmas to decorate the room. We went to Mr Jackson for Science. I remember him teaching us about air pressure with a fountain pen and ink, and an old oil can. Also, ink wells and blotting paper. I remember learning to sing Jerusalem and loving it. Also, Mrs Moore sitting on the radiator near my desk, and I could see her long bloomers! We did country dancing, and had an open day where we performed for parents. Loved it! I was just looking at this site and I thought I recognised my mum in your photo. On reading, you’ve correctly named her as Ann Healey. I will let mum know and get her to check the photo as she may also remember some of the other class mates. This has made my night. I think I’m in this photo, in the front row. If anyone remembers me please get in touch. I lived in Lowther Road and used those Osborne Road steps (365) as I later went to Dorothy Stringer school when it opened. I remember headmaster Mr Slater and his Morris 8 car. Mr Divall, Miss Cowton, Mr Jackson and Miss Spink, Miss Bishop, Miss Brogate and Miss Bacon. Mr Austin the caretaker used the basement under Miss Brogate’s end class.